I gave Donato Carrisi's debut, The Whisperer, a perfect score a few years back. Dubbed the Italian literary thriller phenomenon, I have always remained on the lookout for anything else written by Carrisi and I've bought everything he has released thus far. Originally written in Italian, as I did with his other books I went for the French translation for this novel as well. Read The Vanished Ones, sequel to The Whisperer, during my Central American adventure earlier this year and I wasn't disapointed. Going through a rough patch as far as SFF titles are concerned lately, what with the new Glen Cook, Nicholas Eames, and Myke Cole not living up to the hype, I decided to give The Girl in the Fog a shot and I'm glad I did! Oddly enough, although Donato Carrisi is a bestselling author in various countries, he continues to be virtually unknown in the USA. As is often the case, English language publishers have a tendency to be far behind the rest of the world when it comes to international bestsellers. One only has to look at Stieg Larsson's Millennium trilogy, which became a worldwide literary phenomenon before it was even translated into English. 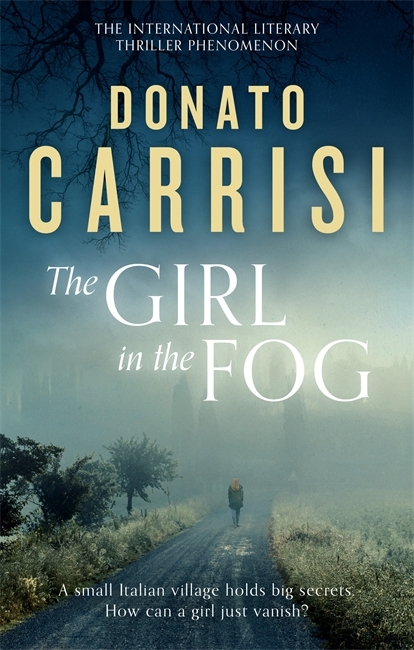 Still, The Girl in the Fog was named the crime book of the month by the Sunday Times, so there might be hope yet. An atmospheric novel about the disappearance of Anna, fifteen, on a cold night in a small town in the Italian mountains close to the Slovenian border. Vogel, a policeman specialising in murder cases, has two suspects: a lonely literature professor who could be connected to the crime; and a teenage boy tracked down via Anna's diary. In true Carissi style, the lines blur between policemen and murderer and Vogel is a potential suspect in the case of Anna's death. Surrounding all this is a media storm with the girl's family at its centre - it culminates in a television interview between Vogel and the professor and a strange and shocking revelation about Anna's death. As is usually his wont, a variety of sources were used by Donato Carrisi for this literary work, chief among them criminology and forensic psychiatry manuals, as well as several FBI papers regarding serial killers and violent crimes. Many true cases, finalized or ongoing, inspired a number of those found within the pages of the novel. With his homework done properly, like its predecessors Carrisi's latest novel has an unmistakable genuine feel to it. In an interview at the end of the book, the author explains that there are less violent scenes in this one because he wanted to focus on fear, especially the fear that you could lose someone, at any time and anywhere. Once more, the characterization is top notch. Investigator Vogel's perspective takes center stage. An unscrupulous cop who has become a master at manipulating the media, a while back he fell from grace when he was accused of creating false evidence to solve a case. He means to use Anna Lou Kastner's disappearance to reclaim his star status and couldn't care less about uncovering the actual truth. All he needs is a guilty party, a monster, regardless of the fact that there is evidence or not. Vogel is assisted by Borghi, a younger cop who doesn't always agree with Vogel's unorthodox methods. For the most part, the narrative is driven by both of their points of view. The third perspective is that of Dr. Flores, a local psychiatrist. The structure of the plot goes back and forth through the timeline of events. It begins with a bang, sixty-two days following the girl's disappearance, as agent Vogel is involved in a car accident and appears to have murdered someone. Suffering from sudden memory loss, he is taken to Dr Flores, who has been charged with finding the truth behind what took place. And in true Carrisi fashion, the more you learn, the less you know. Like its predecessors, The Girl in the Fog is as captivating as it is perturbing. As was the case with all the other Carrisi titles, it is another complex, multilayered thriller that stays with you long after you've reached the last page. It's another clever work with plots and subplots forming a frightening tapestry, all of which culminating toward an ending that will hit you like an uppercut. The Girl in the Fog is also an unapologetic critique of the media and how they cover crime investigations. When all is said and done, this troubling work is everything a thriller is meant to be. If you are looking for compelling and disturbing books delving into psychology that stay with you long after you have finished reading them, give Donato Carrisi a shot as soon as humanly possible! You won't be disappointed!